A couple of weeks ago I wrote a post describing how I'd used the Sunny F16 rule to arrive at an exposure that my handheld meter subsequently told me should have been about three stops lower than my calculation. I've used this rule in the past with success although, being quite far north, I've always given an extra stop just to be on the safe side. The huge underexposure left me a bemused so I decided to look into the process a little more deeply. The earliest reference I seem to have to the Sunny f16 rule is a 1947 copy of the British Journal Photographic Almanac, a compendium of all things photographic for that year. No doubt the rule will predate that by several decades or more but I don't think we need to know the precise start date. A few readers in the sunny parts of America left comments to the effect that Sunny f16 worked for them and one or two from darkest Britain said something like Sunny f4 is nearer the mark over here. Well, turns out they're probably both right. Let me explain. When I was taking a picture of the dogs in my back garden on a dull day, I had 800 ISO film in my Pentax MX and worked out the exposure from the starting point under the Sunny f16 rule of 1/800th at f16. There being no 1/800th speed on the MX, that's about the same as 1/1000th between f11 and f16. I opened up three stops for cloudy dull weather (one stop for hazy sun, another for cloudy bright and the third for cloudy dull) and then gave it my usual extra stop for Scotland. Those four stops extra gave me an exposure of 1/125th at between f8 and f11 so I made it f8. The correct exposure indicated by my handheld meter should have been 1/125th at f2.8. Now, the BJ almanac lists an exposure table for England in the summer and gives the correct setting for a shot of landscapes and beach scenes on a sunny day as 1/25th at f16 with 700 H and D speed film. That method of rating film was way before my time (lower those inquisitive eyebrows) but it seems to be roughly equivalent to 20 ISO. 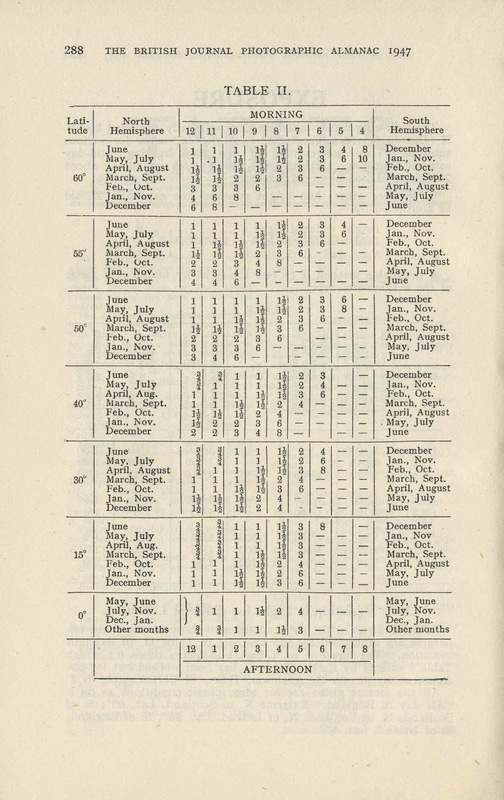 The Almanac also says the exposure table is good for 24 or 25 Scheiner but doesn't say whether it's the European or US Scheiner scale they're talking about. The difference here is between 10 and 50 ISO so 20 ISO would seem reasonable. Or approximately the same as the Sunny f16 rule, then. Since I was measuring a scene in my back garden on a dull day this far north in January, there are a few modifiers the BJ publication suggests. For hazy sun, plus 1 stop, for dull weather plus 1.5 stops and for very dull it's plus 2 stops. For Scotland in January, another 3 stops have to be added and for the shady photograph of the dogs I was taking it's plus an extra 2 stops. If you've been counting, you'll see that it adds up to an extra 7 stops over the BJ's sunny weather recommendation of 1/800th at f16 for 800 ISO film, or, say, 1/100th between f11 and f16. Adding the seven stops gives a modified exposure of 1/125th at between f2.8 and f4 - almost exactly the same as my handheld meter reading. So Sunny f16 is indeed viable when it comes to shooting in the UK but only within very restricted parameters - at the height of summer, on a good day and when taking a nice open landscape or beach scenes. At other times of the year and depending on the time of day and latitude Scotland needs considerable extra exposure - plus due allowance for shady photographs - and it was underestimating this that led me astray. I'd say that up here a safe interpretation of the rule should be Sunny f8 in the summer, Sunny f5.6 in spring and autumn and Sunny f4 in winter. Sticking with those values, I don't think we'd go far wrong. The sunny 16 rule always works! When its sunny!!! I've used it in summer and winter in both hemispheres. My first standard film was K 64. Sunny day you could bet that 250th @ f8 (which is 60th f16) would nail the exposure. Always works. When its cloudy, all bets are off because who can guesstimate how much of a departure from "sunny" your cloudy conditions are? The Sunny f16 rule isn't just for sunny weather! The whole point is that you use Sunny f16 as the starting point and work out the exposure according to wether it's sunny, hazy sun, cloudy bright or cloudy dull. OK, it might not be good enough for slide film (I'd personally always use a meter for reversal work) but for black and white or colour negative it should be. And you can always bracket a stop or two to be on the safe side. At 38 degrees, I don't bother with a Scotland like adjustment, but in January you probably need 3/4 of a stop. My learning of the rule was F16 for full sun (which is here most of the time), then distinct shadows (cloudy bright) 1 stop down. After that, 2 stops no shadows overcast, and 3 for heavy overcast whatever that is. My problem is open shade, I learned 3 stops down but others sources say 2. This must be why they invented exposure meters. Exactly; hand-held meter and an incident reading, takes all the heartache away. I only use sunny 16 when I know it's really going to be sunny 16. for anything else out comes the Gossen. Then again, where I live in Tropical Townsville, Australia. It's truly sunny 16 about 300 days per year. Just found a copy of The Johnson Photographic Year Book 1957 that belonged to an uncle. 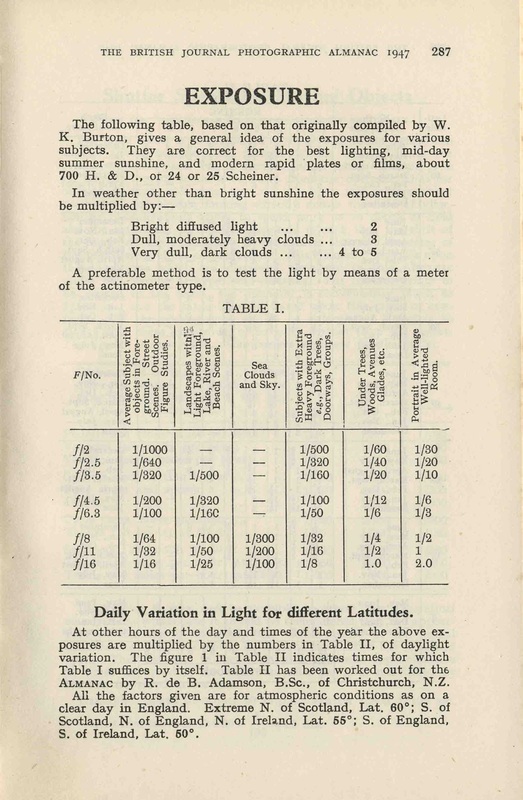 It moves the tables on a bit and has a couple of dial calculators at the back of the book, along with a few Latitude Light Tables that are required to calculate the exposure for both negative and slide films. The quoted film speeds are in B.S. Exposure Indices which is a logarithmic scale. Thankfully there is another table (surprise, surprise!) to convert B.S. film speeds to Scheiner, A.S.A., Weston, Ilford Group(? ), and DIN, should you feel the urge! The pocket book is a mine of information and even gives you trouble shooting hints if your Ferranicolour transparency film doesn't come out as intended Bruce! You'll remember that one of course! :) Even more interesting if your a bit of an anorak is the number of companies making, perhaps including older film products being replaced e.g. 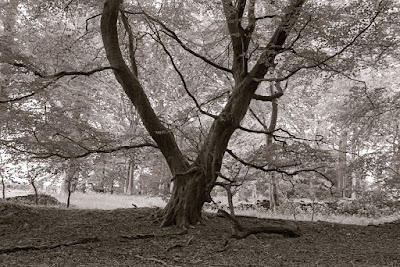 Ilford is mentioned with both FP3 and FP4 films: Adox, Agfa, As de Trefle, Bauchet, Coronet, Crumiere, Ferrania, Gevaert, Guilleminot, Ilford, Kodak, Lumiere, Perutz and finally Standard. I make it a total of 82 films in various formats, roll film and 35mm. Sorry if I'm late to the party. I just dug out my Johnson Standard Exposure Calculator it's a small circular slide rule affair and you dial in the conditions, film speed, month and time and read off the exposure. Guessing January, between 10am and 2pm, it gives around 1/100 to 1/200 at f2.8. Handy little gizmo if you can find one.